Among around 8.7 million species on the planet Earth, no other species ever in the history of this planet has caused a greater devastation to other fellow species than human beings. With rising human population crossed 7 billion now, combined with skyrocketing demands of biological resources from fellow species, human beings have already initiated the sixth mass extinction of species on Earth. Recognising such large-scale devastations, need was felt internationally later in the 20th century to reduce the rate of species loss. In an effort towards this direction, many multilateral environmental agreements (MEAs) were agreed upon by countries, including CITES (Convention on International Trade in Endangered Species of Wild Fauna and Flora). CITES is an international agreement between governments to reduce the international trade of threatened species to ensure that international trade in specimens of wild animals and plants does not threaten their survival. CITES accords varying degrees of protection to more than 35,000 species of animals and plants by including them in the three lists called appendices (I, II and III). The Appendix I species are accorded highest protection. At present, there are 931 species included in appendix I, 34,419 in appendix II and 147 species in Appendix III. It is estimated that about 623 (63 per cent) of CITES Appendix-I listed species, 429 species are experiencing population declines. However, CITES proudly claims that none of the species which has been listed on CITES appendices has gone extinct. CITES entered into force on July 1, 1975 and has now 183 Parties. 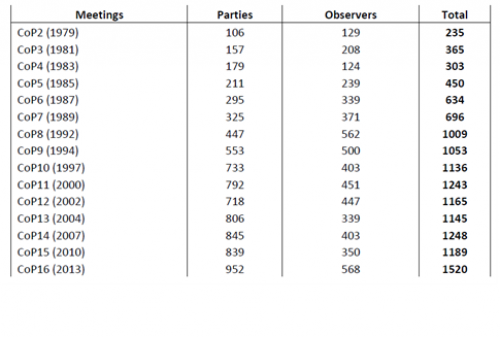 The participants in the Conference of Parties (CoP) held every two to three years has been growing since then as shown in following table. In this series of Conferences, 17th CoP of CITES is being held during 24 September-October 5 in Johannesburg, South Africa, to discuss and decide upon key issues on international wildlife trade. The need for CITES is quite clear considering the fact that annual cross-border wildlife trade is estimated to be worth billions of dollars and includes hundreds of millions of plant and animal specimens. The wildlife trade ranges from live animals/plants to plethora of wildlife products including food, leather goods, timber, musical instruments, medicines, artifacts, ivories etc. 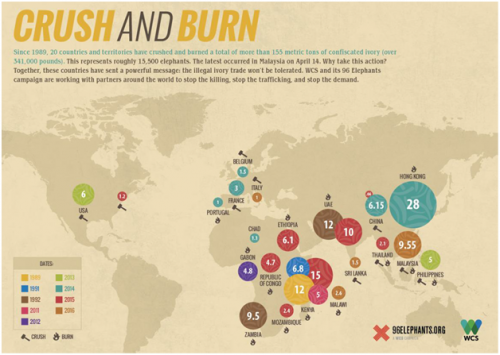 Globally, illegal trade of wildlife is estimated to be worth $19 billion per year, and is rising at an alarming rate. 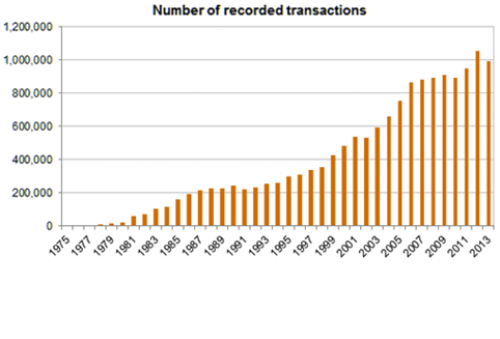 The legal trade stands at much higher $300 billion per year. 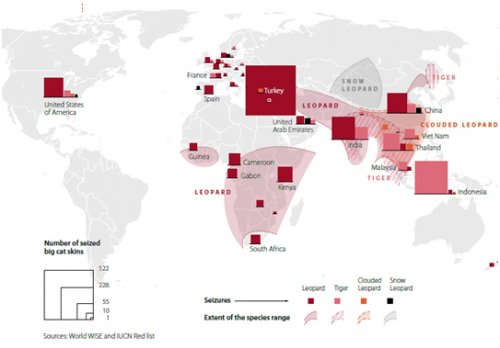 Such massive global exploitation of wild animals and plants is bringing many of the CITES listed species to the brink of extinction. Illegal wildlife trade threatens livelihoods of rural communities and damages natural ecosystems. Increasing profits and low deterrence of wildlife trafficking has caused evolution of highly organised criminal syndicates. Frequently, same syndicates engaged in drugs, arms-trade and human-trafficking are seeing wildlife trade as greener avenues. Evidence shows that the poaching of African elephants is helping finance insurgencies and terrorists. Illegal wildlife trade is also fueling corruption and weakening economies of developing countries rich in natural resources. Determining the scale of wildlife crime is extremely difficult due to the fact that often it is not recorded by government authorities in the same way as other criminal activities, leading to underreporting of wildlife crimes. Further, it is often combined with other forms of crimes such as frauds, counterfeiting and money-laundering. 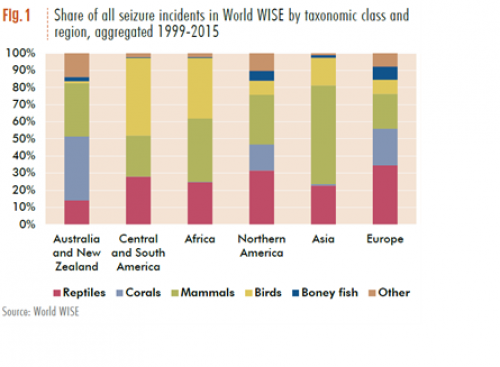 If we look deeper into the trade statistics, almost all types of animals and plants are being illegally traded across borders with mammals, reptiles, corals and birds taking the maximum share. 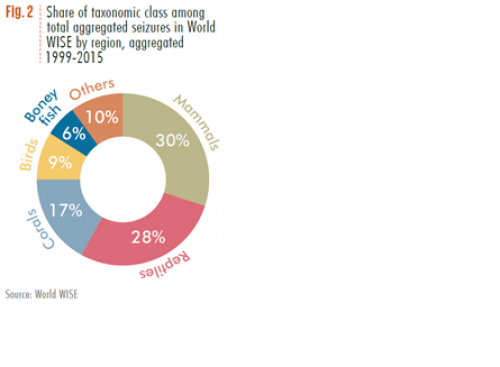 Following charts gives the broad statistics of the seizures. To enhance its action to address the problem, CITES launched in November 2010 the International Consortium on Combating Wildlife Crime (ICCWC), an alliance established between the CITES Secretariat, INTERPOL, the United Nations Office on Drugs and Crime (UNODC), the World Bank and the World Customs Organization (WCO) to bring coordinated support to national wildlife law enforcement agencies. What’s important on the table at CoP17? There are a total of 90 agenda items (with further sub-agendas) to be decided at CoP17 this year. They seek to address issues related to trade control, traceability, species-specific matters such as for elephant, turtles, Asian Big Cats, corals, pangolins, rhinos etc. There are 62 proposals for amendment of CITES appendices including African Elephant, Lion, Zebra, Puma, Peregrine Falcon, crocodiles, lizards, sharks, rays, cacti, rosewoods etc. As fancied by the animal traders across the world, big wild animal species such as elephants, Asian big cats, rhinoceros etc continue to dominate the debates in CITES. Elephants have been continuously hunted for their ivory. African elephants, which are listed in Appendix I of the Convention (with only 4 populations in Appendix II), are under severe threat from poaching and ivory trafficking to meet global ivory demands. Estimates reveal that during 2010-2012, 35,000-50,000 African elephants were illegally killed annually to meet ivory demand. The 2016 data from the CITES programme for Monitoring Illegal Killing of Elephants (MIKE) says that poaching levels in Elephants remain unacceptably high, with populations continuing to decline. Asian elephants also continue to be affected by ivory demand. During recent years, a number of CITES Parties have begun to reduce confiscated ivory stockpiles through destruction by burning or crushing through publicised events to educate the public. A total of 25 big events of ivory stockpile burning have been reported during 2011-16. The following infographic produced by Wildlife Conservation Society illustrates ivory destructions since 1989 up to April 2016. 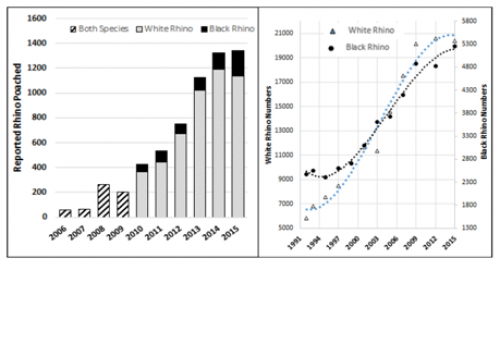 Adding complexity to ivory trade, rise in trade in mammoth ivory (an extinct species) poses an indirect threat to elephant populations in the wild. Large quantities of mammoth ivory, mostly exported from Russia have entered international markets in recent years. From 2007 to 2013, Hong Kong businesses alone imported average 39,183 kg of mammoth ivory annually, 93.5 per cent of it from Russia. An earlier estimate shows that the total volume of mammoth ivory trade went from 17.3 tonnes in 1997 to 95 tonnes in 2012. Poaching in Asian Big Cats, especially tiger, is an long standing problem which has elicited much of CITES attention. 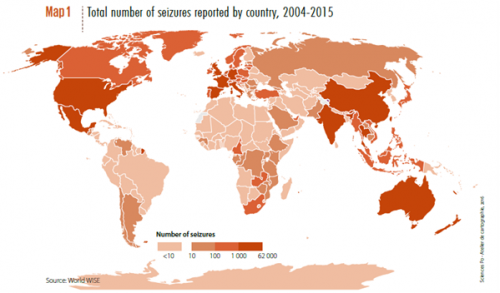 To elucidate the problem, following maps shows trends in seizures of Asian Big Cats specimens for 2005-2014. While big animals continue to create furors at CITES, lesser known smaller species such as Pangolins, Turtles and Tortoises, Snakes, Helmeted Hornbills, Humpback Wrasse, European Eel, Tibetan Antelope etc; as well as plant species such as Orchids, Ebonies, Agarwood, Rosewoods, Red Sanders, Cacti etc are growingly being debated at CITES meetings. As the human population and purchasing powers of richer people in developed and developing countries is growing, CITES is finding it hard to manage the immense growth in illegal wildlife trade and growing demands for wildlife products. Added complexities such as linkages with drug trade, terrorism, insurgencies, challenges in CITES permit systems, problems in wildlife products identification, nuances in various categories of CITES-related trade (personal effects, pre-convention articles, annotations etc), look-alike species, traceability etc continue to haunt CITES authorities of various member countries. However, CITES is taking effective steps such as enhanced wildlife forensic laboratories, combating wildlife cybercrime, National Ivory Action Plans (NIAPs), hunting quotas, permitting captive breeding and artificial propagation of selected species, photographic identification databases for tigers (proposed by India this year) and enhanced cooperation with other international bodies and conventions (CMS, ICRW, CBD, FAO, ITTO, UNODC, INTERPOL etc). Despite all this, controlling illegal wildlife trade is going to be a big challenge for CITES convention and its member countries in coming years too. CITES is an orchestrated war to be fought among countries for many years from now. CITES CoP17 at Johannesburg is all set to be an important battle to be won for the benefit of thousands of CITES listed threatened species. I wish them all success and victory. Will IUCN ban on domestic ivory trade spark a global battle on conservation?